Rockford Fosgate's Punch Stage 3 subwoofers come from a long line of high-performance subs that deliver real deal bass. 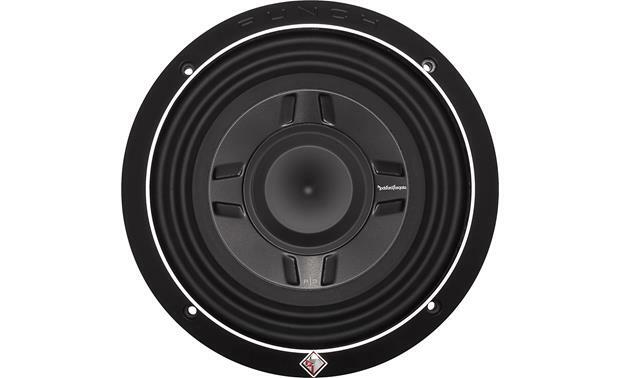 Rockford Fosgate's Punch Stage 3 subwoofers come from a long line of high-performance subs that deliver real deal bass. 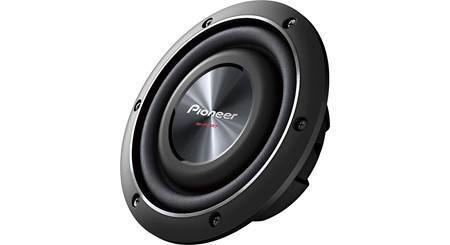 Now, shallow-mount Punch Stage 3 subwoofers make it easier to get impressive low end in smaller or hard-to-fit vehicles. The P3SD4-8 8" shallow subwoofer hangs with its bigger brethren, thanks to advanced materials and engineering. 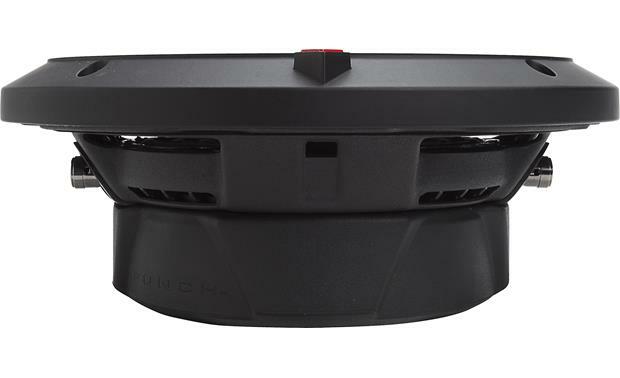 Rockford uses anodized aluminum for the cone and dust cap making the woofer light and easier to drive, yet rigid enough to maintain its shape under maximum load. The M-Roll Santoprene™ surround also provides excellent excursion for maximum output while being durable enough to last. 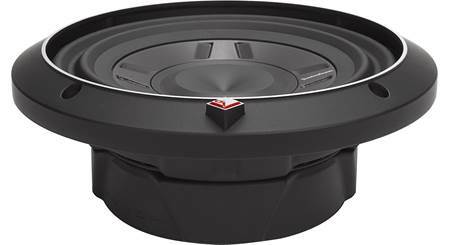 A low-profile frame houses the subwoofer, with abundant venting to battle overheating and thermal breakdown. At 2-5/8 inches deep, this sub will fit into places where no bass has gone before — just build a custom enclosure or find a suitable box. The dual 4-ohm voice coils allow you to wire up multiple subs or to coax optimum performance from your amplifier. 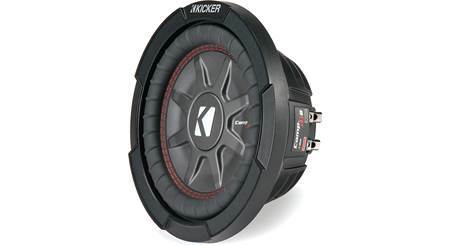 To drive this single subwoofer, we recommend a mono amplifier rated between 120 and 225 watts RMS at 2 ohms. For more information, please refer to our article on How to Match Subwoofers and Amplifiers. Replaced this in my 02 Lexus was more than impressed with product and knowledge of the staff . 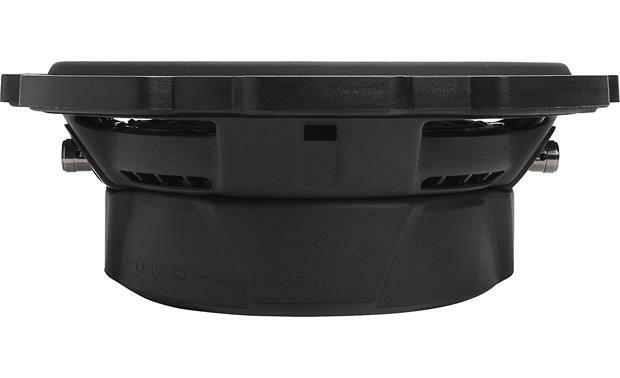 Shallow Mount Design: The Rockford Fosgate Punch P3S shallow subwoofer is designed and engineered with a more shallow motor assembly, reducing the overall depth of the woofer and allowing it to fit in smaller locations in your vehicle. 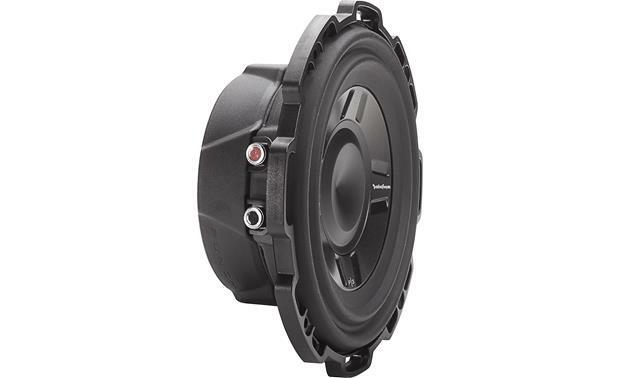 Dual Voice Coils: This woofer features dual 4-ohm voice coils for wiring flexibility. When the voice coils are wired in parallel, the woofer presents a 2-ohm load. When the voice coils are wired in series, the woofer presents an 8-ohm load. Compression Terminals: The P3SD4-8 features spring post terminals which accommodate pin connectors, single banana plugs, or bare speaker wire up to 10 gauge. Note: The rubber magnet cover may need removed (or repositioned) to insert pin connectors or banana plugs. CEA-2031 Compliant: Power handling conforms to CEA-2031 industry standards, meaning the subwoofer has the capacity to handle its rated power under continuous demand, not just for an instant. Trim Ring: For added cosmetic appeal the woofer comes with an aluminum trim ring that mounts over the flange of the woofer. 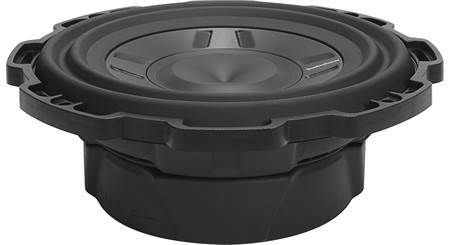 When using the trim ring, the woofer is first mounted with four screws, then the ring is mounted over the woofer, aligning the final four holes of the woofer with the ring. The other four screws are used in these holes to mount the ring and woofer to the enclosure. 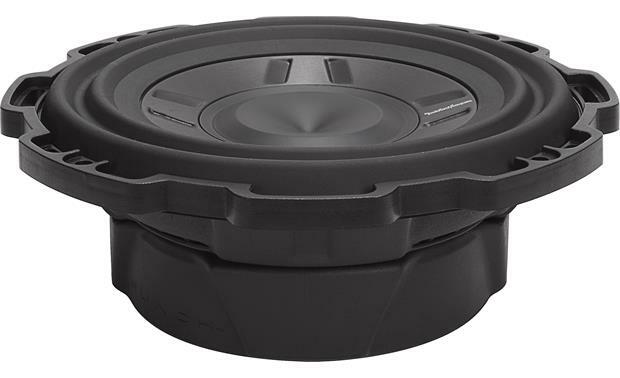 The trim ring increases the mounting height of the woofer to approximately 1 inch, and the ring's diameter is approximately 9 inches. Sealed Box: Rockford recommends a sealed enclosure with an optimum internal volume of 0.25 cubic feet (from 0.2 to 0.70 cubic feet is acceptable). Sealed enclosures provide the most control over a woofer, will handle a lot of power, and provide accurate sonic reproduction, making them suitable to all types of music. 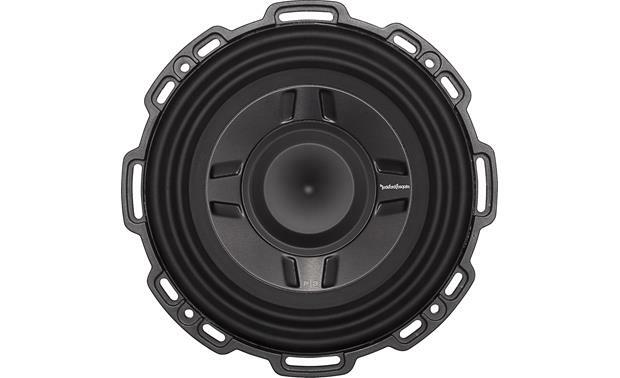 Ported Box: Rockford recommends a ported enclosure with an internal volume of 0.75 cubic feet using one 3" diameter x 9" long port; this yields a tuning frequency of 47.5 Hz. 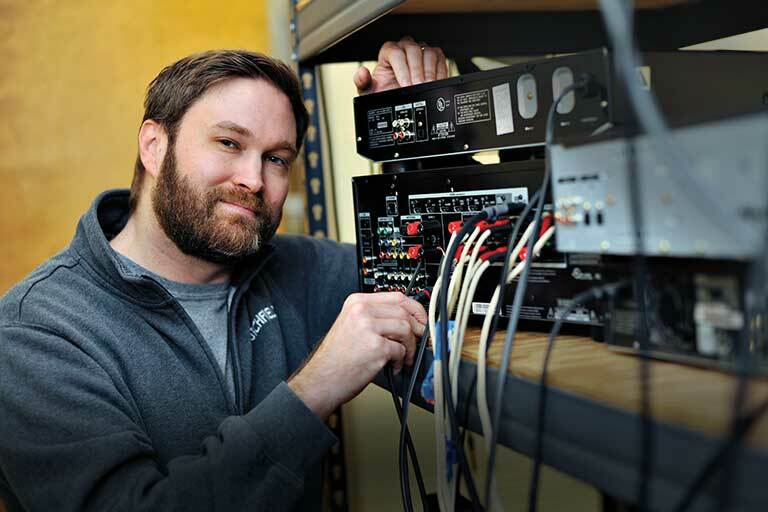 Ported (or vented) enclosures typically provide better overall efficiency than sealed so they are suitable for use with smaller amplifiers, giving you more bass output from less power. However, this efficiency comes at the expense of very low frequency output (below 37 Hz). Will this fit in the factory rear deck location of a 2008 Honda Civic Si Coupe and being powered by the factory Navigation Unit and Amplifier? There is 1.5" of space between the floor of my vehicle and the bottom of the box. Will this subwoofer work or will the cone hit the floor? I'm really not understanding why the distance from the box to the bottom of your vehicle matters about this woofer working. My question to you is, are you concerned about the Woofer fitting in the Box or the Box fitting in you Vehicle? 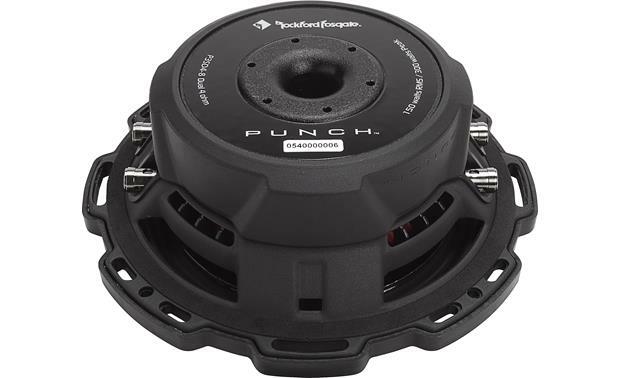 Searches related to the Rockford Fosgate P3SD4-8 Punch Stage 3 shallow 8" subwoofer with dual 4-ohm voice coils.